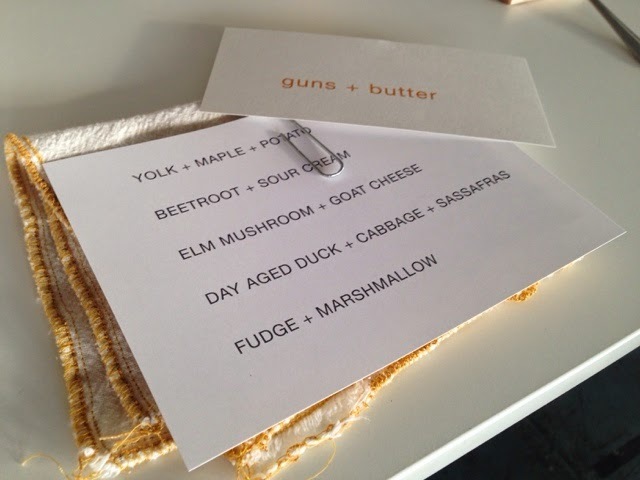 We recently had the pleasure to dine with Guns + Butter Detroit. It was a truly special experience. You may recognize the name from Anthony Bourdain's Parts Unknown: Detroit. Living in Michigan, we don't get to experience food like this very often. 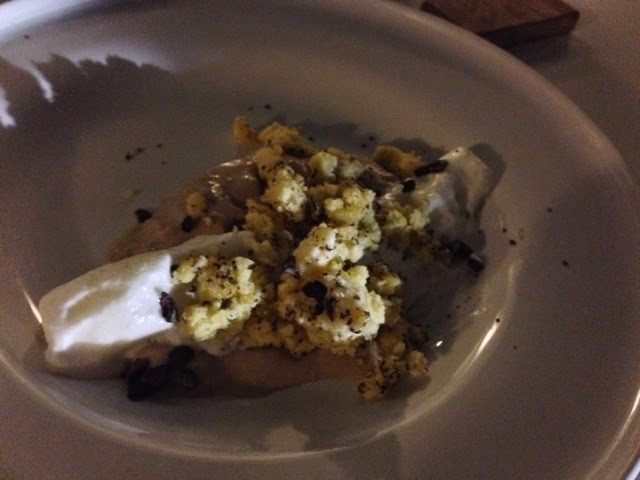 When we ate at Grove in Grand Rapids, the flavor combinations and technique were superb. Much like Grove, the flavor combinations and technique were superb at G+B, but the ingredients were also truly transformed. We are adventurous eaters and cookers, but there were times at G+B where we didn't really recognize what we were eating. This is a good thing, and something truly different from what we have experienced previously. They use in-season and local ingredients when possible. To get on a waiting list with Guns + Butter, you have to email them. You won't know the time, day, or location, but they will notify you of their next event. The location, menu, and timing changes. This will all change once they open their permanent restaurant this summer, so it was important for us to experience the food as a pop-up. 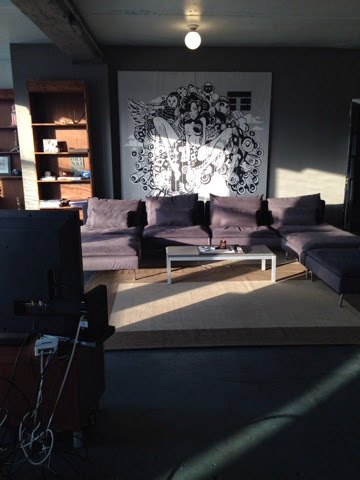 This particular time, the loft space was beautiful. Very open and bright. The artwork was perfect for the location. People were seated in groups of four. 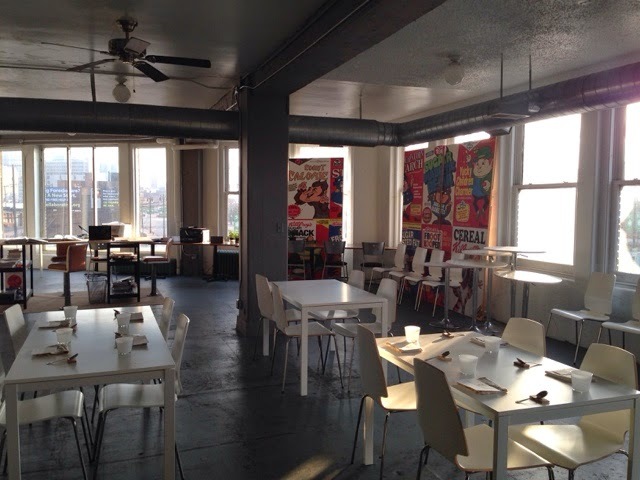 We were lucky enough to sit with a nice couple who attended some pop ups in Detroit previously. They were very knowledgable about food and seemed as excited as we were. You do not get to pick your food. You are served a multiple course menu. This is the exciting part! It forces you to try new things. Our menu is shown below. 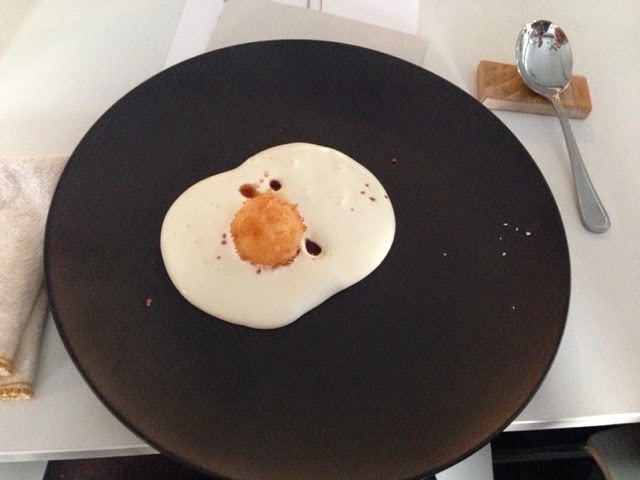 First up is yolk, maple, and potato. I think this may have been my favorite. It was a deep fried egg yolk in a breading (panko?) in a sauce that was creamy and rich. I loved this combination, and if I had any idea how to make this at home, I would do it every day. 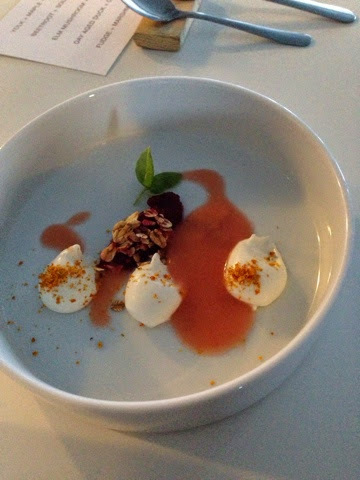 Next was beet root with sour cream. There was a citrus sauce and a crunchy oat topping for texture. There was something special about the sour cream, but again I don't have any clue what they did to it. It tasted fluffier than normal. The flavors were bright and fresh and perfect after the rich first course. Next up is elm mushroom and goat cheese soup. I don't know what an elm mushroom is, nor do I like goat cheese, but this was delightful! It had a smoky flavor with toasted sunflower seeds in the bottom for texture. 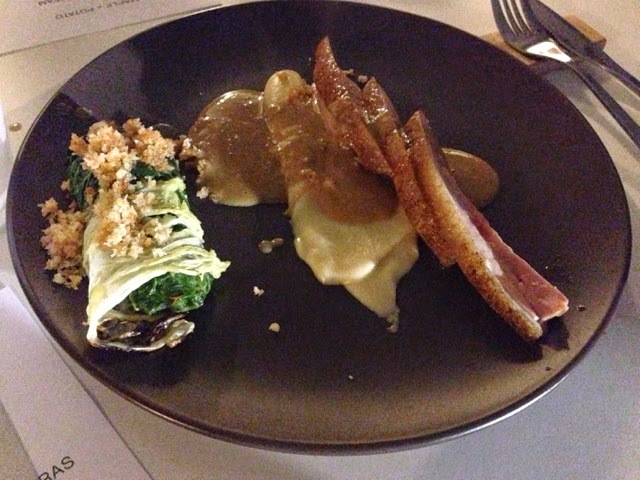 The main course was day aged duck + cabbage + sassafras. The duck was tender and had perfectly crispy skin. The cabbage roll had some toasted breading and a duck filling. 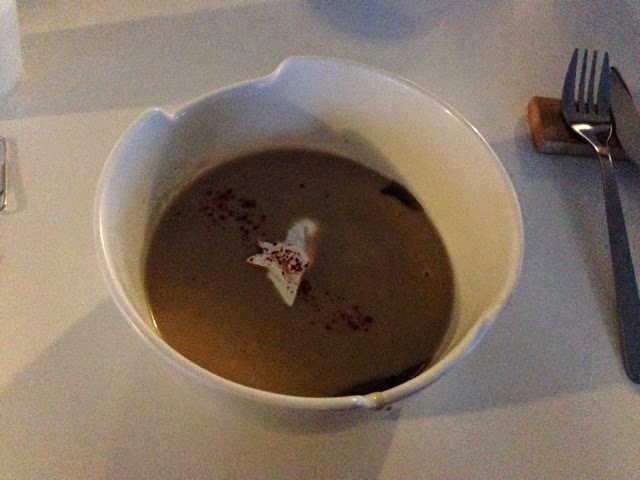 There was a creamy sauce with a foie gras sauce served table side. I'm not sure where the sassafras came in because I don't know what it tastes like, but it was all so amazing! Maybe this was my favorite plate. No, wait. Dessert. Dessert was my favorite. It is called fudge + marshmallow. I have no idea how they made the chewy chocolatey cake on top, but I have never had a dessert with that texture. It was amazing and I wish I knew how to make it, or even what that technique is! We had a great time at Guns + Butter. We are so happy that we saved up for this special meal because you will not find anything else like it in Michigan. Sorry about the bad photography but we didn't want to use flash at such a special occasion! 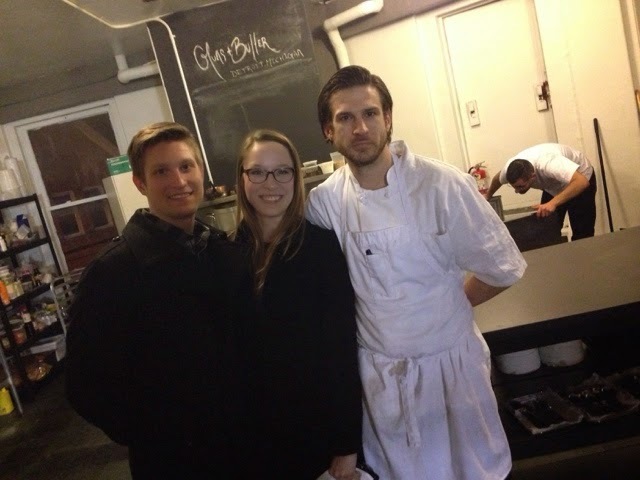 Bravo to the head chef, Craig Lieckfelt, and the entire staff. We felt like the intimate setting really added to the meal. The chefs were cooking a meal especially for us, and we got to watch. This made us feel very special, and the love that they have for the food and ingredients really shined through.